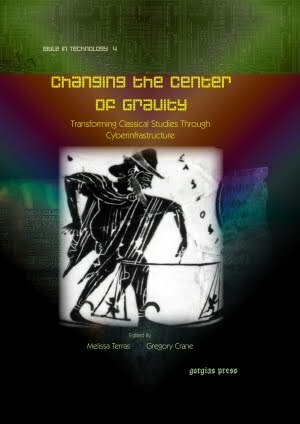 Here’s the book cover for Changing the Center of Gravity – the book of essays in memoriam to Ross Scaife that was first published as an online journal volume in DHQ. It’s in press, and should be out shortly. The British Museum kindly gave us permission to use the image on the front – psychostasia, the weighing of the souls, as featured on a white ground, black figure Lekythos, around 480BC. We thought this a fitting tribute to Ross and a poignant image- not only was he fond of black figure painting from this period, and the scales reference the title of the book, but the weighing of the souls refers to the gods balancing the scales to determine which heroes will not return from battle.